It has double door at front, allowing wide range for storage of various seeds under controlled conditions of temperature and humidity. This double walled unit has outer chamber made of M.S. duly enamel painted and inner chamber is made of Stainless Steel. The chamber has glass windows which allow easy inspection of samples. We are a well-renowned organization in the industry to provide our patrons the best quality array of Prefabricated Steel Cabin. With Full Locker at the top in the second compartment, A safe is fitted at the bottom. The safe door is usually fitted with 8 lever dual control lock with one drawer in-side the safe. Door :Double door with double locking system with stainless steel keys. A complete range is available in this series. Mirror with Light and Decorative On/Off Swich inside Mirror. These are available in various sizes as per customer requirement. 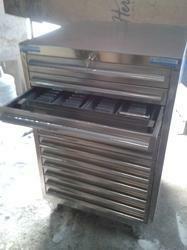 We excel in the manufacture of Stainless Steel Cabinet. Our top-class Stainless Steel Cabinet are used as a fabrication item for Stainless Steel Cabinet. Our stainless steel cabinets are last long. In addition, our Stainless Steel Cabinet is absolutely rust-free.